Service and host dependencies are an advanced feature of Nagios that allow you to control the behavior of hosts and services based on the status of one or more other hosts or services. I'll explain how dependencies work, along with the differences between host and service dependencies. First, the basics. You create service dependencies by adding service dependency definitions in your object config file(s). In each definition you specify the dependent service, the service you are depending on, and the criteria (if any) that cause the execution and notification dependencies to fail (these are described later). You can create several dependencies for a given service, but you must add a separate service dependency definition for each dependency you create. The image below shows an example logical layout of service notification and execution dependencies. Different services are dependent on other services for notifications and check execution. Nagios gets the current status* of the service that is being depended upon. Nagios compares the current status of the service that is being depended upon against either the execution or notification failure options in the dependency definition (whichever one is relevant at the time). If the current status of the service that is being depended upon matches one of the failure options, the dependency is said to have failed and Nagios will break out of the dependency check loop. If the current state of the service that is being depended upon does not match any of the failure options for the dependency entry, the dependency is said to have passed and Nagios will go on and check the next dependency entry. This cycle continues until either all dependencies for the service have been checked or until one dependency check fails. Note: *One important thing to note is that by default, Nagios will use the most current hard state of the service(s) that is/are being depended upon when it does the dependeny checks. If you want Nagios to use the most current state of the services (regardless of whether its a soft or hard state), enable the soft_state_dependencies option. Execution dependencies are used to restrict when active checks of a service can be performed. Passive checks are not restricted by execution dependencies. If all of the execution dependency tests for the service passed, Nagios will execute the check of the service as it normally would. If even just one of the execution dependencies for a service fails, Nagios will temporarily prevent the execution of checks for that (dependent) service. At some point in the future the execution dependency tests for the service may all pass. If this happens, Nagios will start checking the service again as it normally would. More information on the check scheduling logic can be found here. 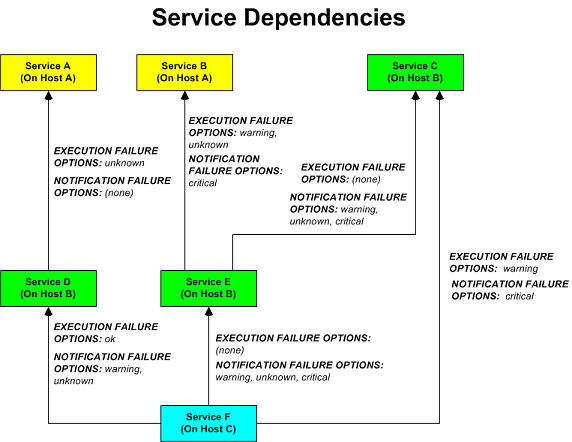 In the example above, Service E would have failed execution dependencies if Service B is in a WARNING or UNKNOWN state. If this was the case, the service check would not be performed and the check would be scheduled for (potential) execution at a later time. If all of the notification dependency tests for the service passed, Nagios will send notifications out for the service as it normally would. If even just one of the notification dependencies for a service fails, Nagios will temporarily repress notifications for that (dependent) service. At some point in the future the notification dependency tests for the service may all pass. If this happens, Nagios will start sending out notifications again as it normally would for the service. More information on the notification logic can be found here. In the example above, Service F would have failed notification dependencies if Service C is in a CRITICAL state, and/or Service D is in a WARNING or UNKNOWN state, and/or if Service E is in a WARNING, UNKNOWN, or CRITICAL state. If this were the case, notifications for the service would not be sent out. As mentioned before, service dependencies are not inherited by default. In the example above you can see that Service F is dependent on Service E. However, it does not automatically inherit Service E's dependencies on Service B and Service C. In order to make Service F dependent on Service C we had to add another service dependency definition. There is no dependency definition for Service B, so Service F is not dependent on Service B. If you do wish to make service dependencies inheritable, you must use the inherits_parent directive in the service dependency definition. When this directive is enabled, it indicates that the dependency inherits dependencies of the service that is being depended upon (also referred to as the master service). In other words, if the master service is dependent upon other services and any one of those dependencies fail, this dependency will also fail. Since the inherits_parent directive is enabled, the dependency between services A and D will be tested when the dependency between services F and D are being tested. Dependencies can have multiple levels of inheritence. If the dependency definition between A and D had its inherits_parent directive enable and service A was dependent on some other service (let's call it service G), the service F would be dependent on services D, A, and G (each with potentially different criteria). As you'd probably expect, host dependencies work in a similiar fashion to service dependencies. The difference is that they're for hosts, not services. Tip: Do not confuse host dependencies with parent/child host relationships. You should be using parent/child host relationships (defined with the parents directive in host definitions) for most cases, rather than host dependencies. A description of how parent/child host relationships work can be found in the documentation on network reachability. The image below shows an example of the logical layout of host notification dependencies. Different hosts are dependent on other hosts for notifications. As with service dependencies, host dependencies are not inherited. 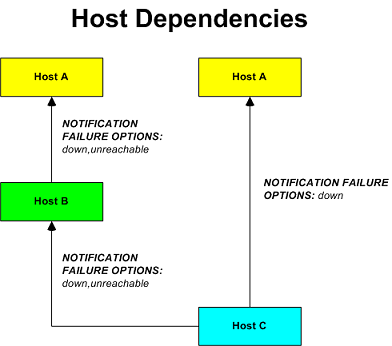 In the example image you can see that Host C does not inherit the host dependencies of Host B. In order for Host C to be dependent on Host A, a new host dependency definition must be defined. Host notification dependencies work in a similiar manner to service notification dependencies. If all of the notification dependency tests for the host pass, Nagios will send notifications out for the host as it normally would. If even just one of the notification dependencies for a host fails, Nagios will temporarily repress notifications for that (dependent) host. At some point in the future the notification dependency tests for the host may all pass. If this happens, Nagios will start sending out notifications again as it normally would for the host. More information on the notification logic can be found here.